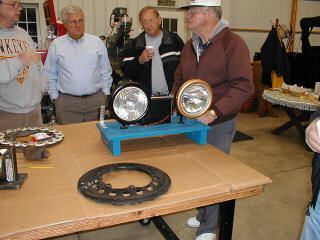 The June meeting was held at Jack Putnam's shop in Bluffton. Bob Torbet led the meeting with 16 members, 1 new member, and 1 guests in attendance. The treasurer's report was read and approved. Bob Hollister has the radiator on his coupe. With a little prodding, I'm sure that we can get him on the road. Bill Phillips will be ready as soon as he gets his exhaust manifold straightened and put back on the car. Bob Torbet has the touring up and running. It has already been placed into service by taking some young people to a special event. The summer/fall tour to the islands is now aiming at the third weekend in September. This is the Historical Weekend on the island. The plan is to get there on Friday night and spend Saturday touring the sites on the Island. It has been suggested that we have our cars to the ferry by 11:00 am on Sunday to ensure that we get off of the island sometime that day. They say that there is a rush after church on Sunday. 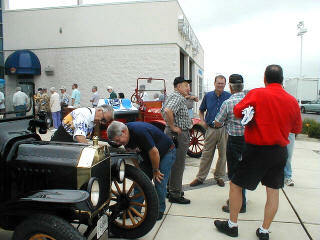 The Ford celebration at Findlay Ford was discussed and the membership agreed to have cars at the event. Stan had asked us to come to Findlay to help celebrate the 100 Year Anniversary instead of going all of the way to Detroit. Dennis Russell's RR would be open at the same time, giving rides to the kids and adults too. Dave and Rod said that they'd be going to Detroit on the 12th to the 16th of June for the big Ford event. We will expect a full report. Mel told about his adventure with the MTFCA Eastern Tour in Henderson, NC. He said that the tour had lots of good food and the group that he toured with was a great bunch of people. This North Carolina Tour goes on every year. Call Mel if you're interested in attending next year's tour. I'm sure that he'd be glad to help you get all of the information on the event. Please make a note that the July meeting will be on the normal first Wednesday of July; but, the time has been moved up to 6:00 pm. The meeting will be a potluck, with each member bringing a covered dish or desert. Please bring a guest. Findlay Ford invited club members to spend the day displaying their cars in front of the dealership to help promote the 100 year anniversary of the Ford Motor Company. This gave us a chance to show the cars in a non car show setting. Stan provided "FORD" beach towels and a nice little 100 Anniversary pin to all of the guys. 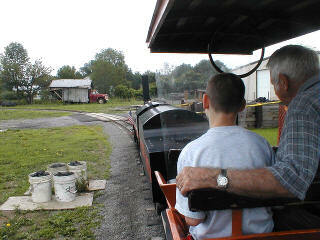 We also had the chance to go next door and ride behind the live steam engine on the other side of Russell Electric. I thought that I took a picture of Dennis Russell's four wheel drive T and his dad's touring; but, the camera must have malfunctioned. If anyone got a good shot of their cars please get them to me for the next newsletter. You can see that there was a good turnout. The food was good and the crowd was polite. I'd say that it was better than the turn out in Toledo. It was good to see so many of the club member's cars. There were both A's and T's. 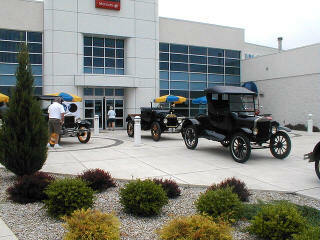 Jack's truck and Richard Briggs' 1909 were in the showroom for the week. I think that Stan was Happy. I know that this assistant was. 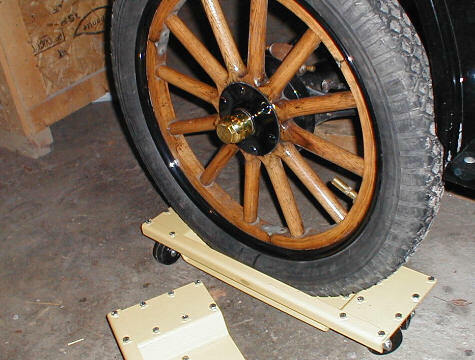 We always use the display of Model T's to diagnose problems and come up with future projects for the club members to tackle. Some of the problems are simple like tha malfunctioning headlight on my 1926 Tudor. It seems that the little spring that makes the contact with both the bulb and the wiring plug is broken. 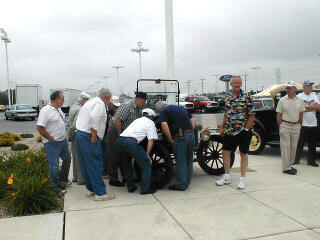 On the other hand, Ralph Wyatt has a knock that needs attention before he puts too many more mile on his 1916. Dennis Russell's steam engine runs like a charm and needs no attention from us at all. I'm jealous!!!!! One of the great things about meeting at Jack's shop is the parade of vehicles that make their way through the doors during the year. This is a 1916 that was brought in for some engine work. Although the owner has had this car for a long time, the car has spent most of its life as a static display at a suburban Columbus eatery. 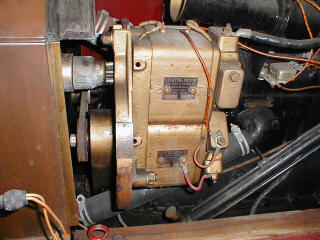 Under the hood we found a combination starting motor/lighting Dynamo made by the John O. Heinze Company. 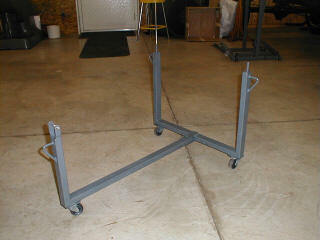 This thing will make getting to the engine a bit trickier than most. As I mentioned earlier, the next meeting will be July 2 at 6:00 pm. There will be hot dogs provided. Everyone is asked to bring a covered dish and a guest (a wife is OK if that's all you can find). Deserts are also welcome. 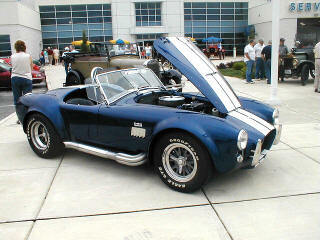 Here's a chance to let your friends know what the "OLD CARS" fascination is all about. As this has been a wet Spring and early Summer, mosquito repellent is suggested. The picnic will be held in Jack's yard as long as the weather remains tolerable. Also, you are encouraged to bring lawn chairs and a 6 pack of your favorite beverage. You are promised a great time with a money back guarantee. Our club president, Bob Torbet, would like to go touring. Any weekend tour that you may have in mind would be great. We,ve even talked about single day tours. Let's get out and drive those T's. 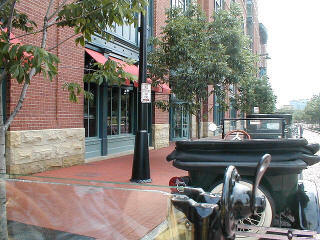 Here are a couple of pictures of a recent tour in Columbus, Ohio. Nine T's and a Model A started the day and nine T's finished. The stop and go traffic was hard on the bands; but, the experience was well worth the aggravation. While we were parked near the old Ohio State Penitentuiary, the cops came driving by and stopped. When we said that we would be moving the cars out of the No Parking Zone very soon, they just told us to take our time while they admired the cars. 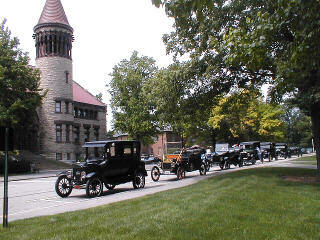 Model T's parked in the center of Ohio State University. These nine cars were filled with eager enthusiasts that will do anything to get their T's on the road. 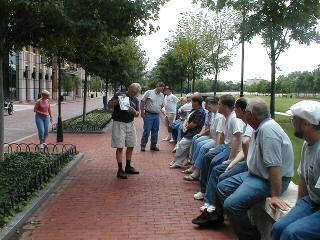 Jerry Banks was our tour guide for the day. We probably saw 20 points of interest that day and even a couple of unexpected ones. This is a tour that Jerry had been contemplating for a long time. The response was overwhelming. 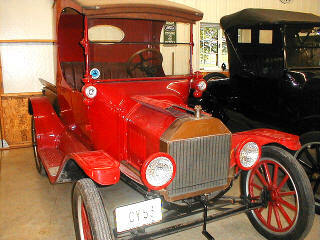 Like I've said, any reason is a good reason to go touring in a Model T Ford.